As some of you may know, my last novel, the brilliant Whiskey Rebels (now available in paperback! ), was trashed in a New York Times review by right-wing meanie, Walter Olson. Now, my feelings were hurt, and I wept directly into my cat’s fur for several hours, but rather than take the low road, I think I showed who, precisely, was the boss in my clever and scathing response. That’s just the kind of guy I am. He wrote a mean review of my book. That's not very nice. Alice Hoffman, apparently, is not the kind of guy I am. I don’t know Hoffman and I haven’t read her work, but I was nevertheless amused by this article in Gawker which describes how Hoffman uses Twitter to — and there is really no other term for this — freak the [redacted] out over what is certainly a mixed review, though not a vicious or irresponsible one — like some people write. 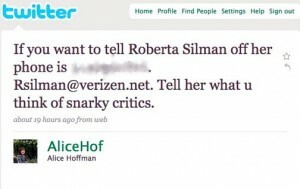 Hoffman calls the reviewer an idiot and posts the reviewer’s phone number, urging Hoffman’s fans to call her up and tell her what a doo-doo head she is. Maybe this is why I’m not on Twitter. I can’t be trusted with this kind of power. This is the sort of thing I would do if my wife didn't stop me. I know several journalists, but only one of them has been portrayed in a movie by Steve Zahn. I refer to Adam Penenberg as he was immortalized in the vey cool film, Shattered Glass. Adam Peneberg has just published an interesting cover piece in the new Fast Company about, of all things, the Kindle. As the hundreds of thousands of you who read this blog already know, I am hoping to get a free Kindle. If Amazon sends me one, I will be its best friend. Check it the article here. One a side note, how many steps does it take you to get to Arnold Schwarzenegger? I can do it in five. permission, so don’t stalk him or it will make me look bad. 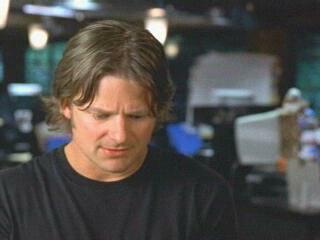 Steve Zahn as a thoughtful Adam Penenberg. much wiser he would have been with two Kindles. 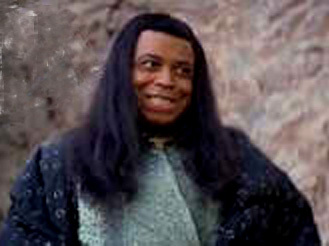 Who could forget the villainy of Thulsa Doom? He’s pointing at you, you know. Sadly, one of the last known pictures of the King of Pop. It’s true, he lived much of his life in isolation, but I will always have the fond memories of visiting him at the Neverland ranch, talking about major trends in 18th century European economics. Now we will never see the Weird Al Yankovic parody of the video of the song MJ would have written about The Devil’s Company, which goes on sale July 7th, you know. 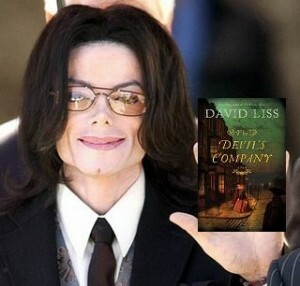 Interestingly, Michael Jackson was also planning on reading The Devil’s Company (on sale July 7th) on his Kindle – the sort of Kindle I would like for Amazon to send me for free. It’s a small world. Every blog must have a great and noble purpose, otherwise you’ve got nothing but some jerk spouting his opinions, and who wants that? So here is my purpose: I would very much like it if Amazon sent me a free Kindle. Back when they first launched this amazing device, they posted raves from writers who had received promotional Kindles. I was not one of these lucky recipients. Yes, these were all writers who sell more books than I do, but that is not the point. The point is that I wanted a free Kindle and did not get one, and I intent to keep complaining about this in the hopes that Amazon will send me one. I can then use this space to talk about how much I love my Kindle. I can post pictures of me and my Kindle traveling together, going to the movies together, eating ice cream together. Really, it is in Amazon’s best interest to send me one. Look how many times I’ve linked to them in this one post. I swear I am good for it. If you, yourself, have a blog, then why not post an entry about how much you would like it if Amazon sent David Liss a free Kindle? You too can be part of this magic moment, this time when, despite the many things about which we disagree, we came together to demand that I get something expensive for free. Check back regularly for updates on how our campaign is going. Also, I want the DX. Shortly after my first novel came out, I received a very kind email from Bill Rosemann, an editor at Marvel Comics, who expressed an interest in having me write some scripts for Marvel. Something about my fiction suggested to him that I might have something to contribute to comics, and he compared Benjamin Weaver, the protagonist in A Conspiracy of Paper, to the superhero Luke Cage. At the time, I had no idea who Luke Cage was, but now, as a fan of Brian Michael Bendis’s New Avengers, I get and appreciate the comparison. In any case, the offer was left open and unspecific. I grew up reading comic books and remained a fan into my 20s. Eventually I gave them up as a lot of the titles I liked lost steam, and as I ran out of time for leisure reading because of the demands of grad school. The cancellation of Keith Giffen’s brilliant and absurd series, The Heckler, about a superhero with no power but irony, was really the last straw for me. As enticing as Marvel’s offer was, I simply didn’t have time to reacquaint myself with the Marvel universe in order to propose something that I hoped would be accepted. More importantly, I had just published my first novel, and I was deep in a terrible case of 2nd-novelitis, trying to figure out just how the hell these book things were written. Trying to figure how to write a comic book script on top of that was more than I was willing to take on. Then, last fall, Bill Rosemann contacted me once again. To commemorate their 70th anniversary, Marvel was putting together a series of single-issue books, each focusing on a minor character from their first decade, and each having been revived for the terrific (and sadly unfinished) miniseries The Twelve. 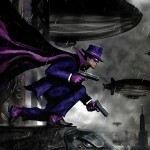 I was offered my shot at The Phantom Reporter – cub reporter by day, scourge of the underworld by night. 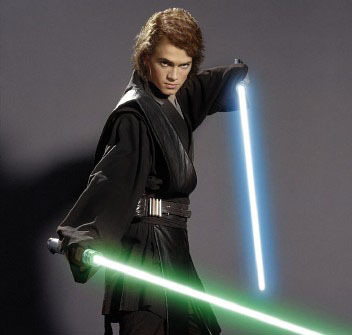 The timing was perfect, and so was the character, since there was no lengthy back story (very little was ever established about him), and no worries about the Marvel continuity. I could either do something with the character in his contemporary setting (see The Twelve #1, faithful reader, to find out what he is doing in a contemporary setting), or his native milieu of the late 1930s. 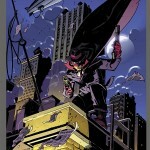 I went with the latter, and chose to write the heretofore untold origins of the Phantom Reporter. I love origins stories. The issue, Daring Mystery Comics Annual #1, with art fantastically rendered by Jason Armstrong, comes out on September 2nd. 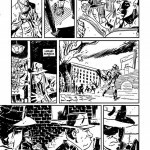 In the meantime, you can read previews at Newsarama and Comic Book Resources. What is this Devil’s Company you speak of? Looking to learn more about my forthcoming novel, The Devil’s Company? I thought so. Why, here I am at some kind of book fair thingie last year talking about it surprisingly cogently. Also, just published is a nice little Q&A about the new book at Texas Monthly. Posted in Uncategorized | Comments Off on What is this Devil’s Company you speak of? 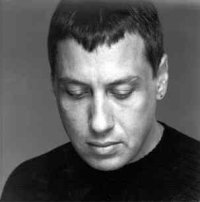 Well… when I go to your website (excited, because I just acquired The Whiskey Rebels and The Ethical Assassin, having been Liss-free since the last Weaver book) and click on “Blog”, I hope to find the fascinating insights of my favorite Jewish historical fiction author. Instead I see a message exhorting me to buy your books, which I’ve already done (and The Devil’s Company is pre-ordered). And no message stating a “launch date” for your blog. My recommendation is to fix that. My dear anonymous and loyal friend, I have fixed it! I have taken your recommendation! I am blogging! Now I know I am someone because instead of keeping my opinions to myself, I am expressing them to the entire universe. More to come, as soon as the people who built my new web site tell me how to use it…. It will be soon, so stay tuned. 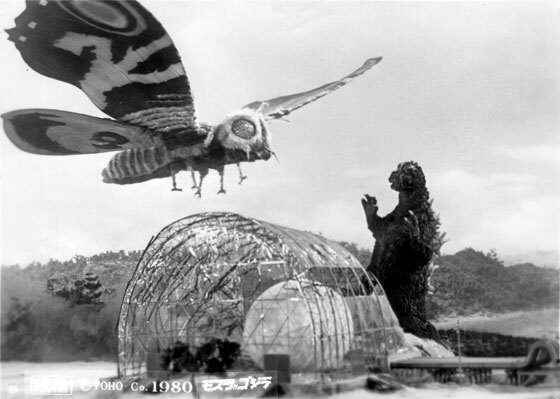 In the meantime, here is a picture of Godzilla fighting Mothra.